I'm recovering today from a wonderful surprise baby shower yesterday. I cannot wait to recap for you as soon as it all soaks in and I can go through all of the photos. I am overwhelmed by how many friends & family came to celebrate and am so lucky to have the best mom, dad, sisters, in-laws (mom, dad, brother & sister-in-law!) and husband ever who put together this amazing party. 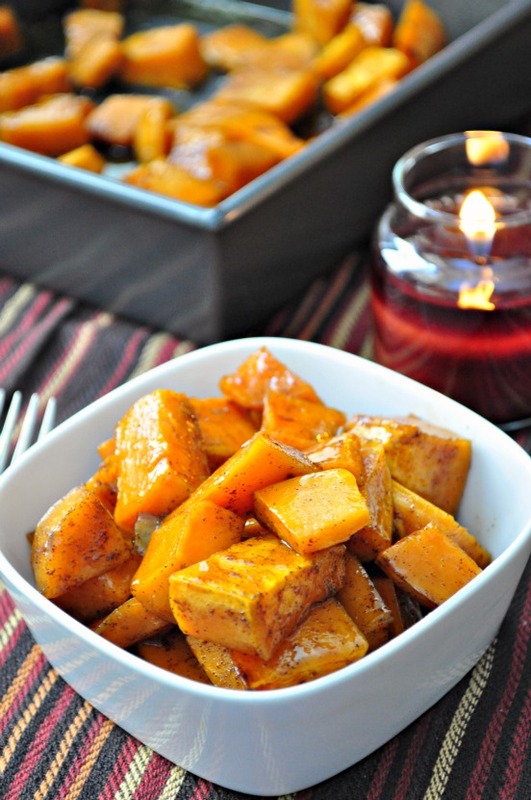 Meanwhile, after doing extensive research on what to make for Thanksgiving, I'm so glad that I found Thrifty Veggie Mama's maple glazed sweet potatoes as part of this month's Secret Recipe Club since it's a simple, healthy yet seemingly decadent side dish that's worthy of this year's Thanksgiving table. I really loved searching around Jamie's blog for a recipe to make. One looked better than the next! Jamie has a beautiful family and made the decision for them to go vegetarian two years ago. I promise you, her recipes are all so gorgeous that you won't even give meat a second thought. I truly loved this recipe. It was so simple and SO.DELICIOUS. I'm notorious for loving my sweet potatoes to be sweet...despite Shaun's best efforts to convince me otherwise. This recipe is fantastic because it's healthier yet feels like a real treat! The result of roasting these taters in maple syrup, cider vinegar and cinnamon was a soft sweet potato with a light gooey glaze...could they look any prettier?! **Note: I halved Jamie's recipe since it was just for Shaun and me! For a bigger portion, double this recipe, or head over to her site for the original recipe! In a bowl, whisk together the syrup, vinegar, oil, water and cinnamon. Pour over the sweet potatoes and toss to coat. Spread into 9-inch square pan and cover with foil. Bake for 10 minutes. Remove foil and continue baking for 30-35 minutes until the potatoes are tender and the syrup mixture is gooey and bubbly, stirring occasionally. Serve immediately and try not to consumer entire pan in one sitting. Easier said than done, in my opinion.